No need to complex configuration on server (Linux). Few complexity on OS X client to automaticly mount the disk. (require to use the OpenDirectory or local database. Solved by using NFS Manager software). Can be included into automount (auto_home) to ease auto mounting of NFS shares. On OS X clients, only few problem with reserved ports and speed that can be solved by using an appropriate configuration. Good support. Almost easy to configure on server part (Netatalk on Linux). Whereas still some application do not work (uncompressing a zip file with the context menu, for example). Not well supported by OS X 10.7 (not supported for Network home folders, but functionnal for direct mounts). Works identically as with previous OS X version: Work properly with extended attributes & characters encoding limitations. 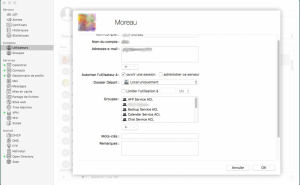 Note: NFS is not selectable in macOS server, whereas it appear to be very stable. Using AFP several problems occurred with different services (iCloud, Keychains, AddressBook…). Apparently this was because of Extended Attribute that was not fully compatible between HFS->AFP(netatalk)->Ext4. Probably using ZFS on Linux server with Netatalk could have resolve some of those problems. Addressbook application do not display any address (and is working well when the home is set to a HFS filesystem). Apple will stop any development on AFP and is now supporting SMB. So I try Samba to see if all of those problems will disappear. Note: It has to be mentionned that a macos server is running onto the Linux server with VirtualBox. This was because has of 10.8 OSX release, the OpenLDAP system implemented onto Linux server was not supported anymore by Apple Server tools. Seem that Apple tries to leave from LDAP (and Open Directory). So the Linux server keeps NFS, Netatalk and SMB services. The trick is to use a local directory, where will be located the Library folder. Other folders will point to Samba (or NFS) mounts. The problem is that Samba is not mounted early in the boot process, thus the background pictures are lost. Only a NFS mount is mounted early, so Pictures will be located there. An idea would be to use an automount of the Samba mount, but Samba requires a specific user/password (whereas NFS and AFP doesnot). It is problematic if several users uses the same Mac client (this could be resolved by using a logout script that unmount the particular user Samba share: do not work for simultaneous users). Create the associated user directory in /Users localy on the client disk, if it doesn’t exist already. Add a startup item which is a SMB remote folder to the Users (System Preferences->Users & Groups->Startup Items…). This way the /home directory will be automatically mounted when accessed. Apparently it would be possible to automatically add the nfs server address via directory service (OpenLDAP). Also, for users with shared Unix systems: Link all .bash* files and so on files that can be used on both original Linux system and macOS.